Ever since humans developed the ability to transfer their thoughts onto paper, the spread of human knowledge has continually taken big steps toward progress. From Thales of Miletus (the first known philosopher) all the way to Paulo Coelho’s The Alchemist, humans have successfully passed on their experiences through books. No one can argue the importance of the Gutenberg printing press, which fueled the desire to acquire knowledge during the Renaissance and Enlightenment periods in Europe. Throughout history, books and knowledge have been treated as conjoined twins—one could never exist without the other. However, the advent of modern technology has dramatically changed the way we perceive knowledge. The fine line between information and knowledge is essentially fading away, and because of that, the culture of book reading is also facing a potential degeneration. Nevertheless, if you are one of the few whose love of printed books has not yet been routed, there is plenty of solace for you yet, in this tech-savvy age. Libraries firmly stand their ground and are home to some of the most influential and ancient printed books—writings that have helped shape human thought and history over the ages. 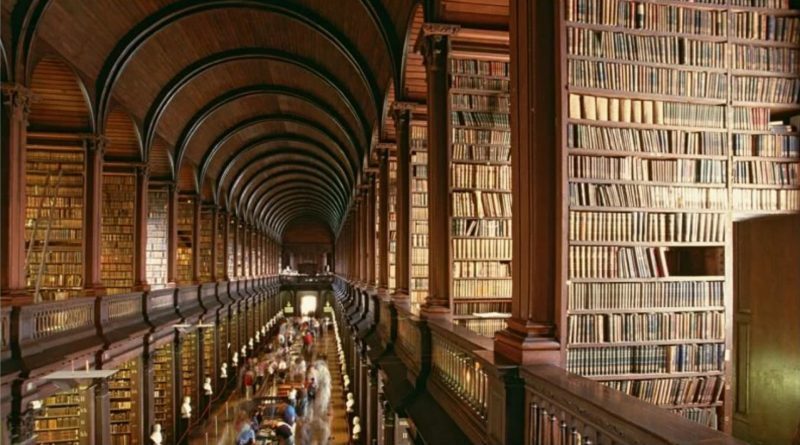 One such dedicated library that can still be visited is at Trinity College in Dublin. Catering to the knowledge-hungry for over three centuries, this stunning library holds over 200,000 books, ranging from popular classics to all known genres of printed books. 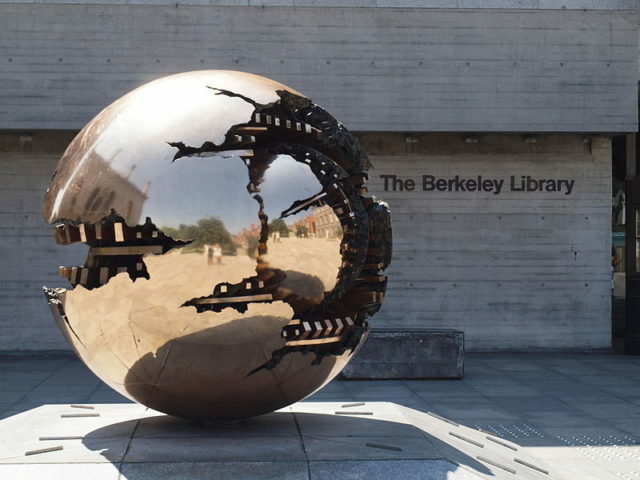 Moreover, a large collection of free-of-charge materials published in the Republic of Ireland is also received by the Trinity College Library on a regular basis. Perhaps the most illuminating attraction of the Trinity College Library is the famous Book of Kells, revered and respected by devout Christians and secular historians alike. For many centuries, this work was known as the Gospel of Columba, as it was associated with a monastery founded in the 6th century by the Irish monk Colm Cille, or Columba, as he’s commonly known. 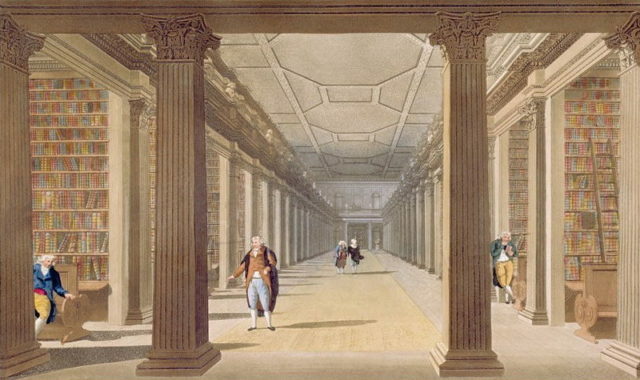 Watercolor of the chamber before the roof was raised. However, modern scholars are confident that the Book of Kells came from a much later period, and that it was probably completed sometime around the end of the 7th century AD. Trained staff at the library turn the pages of the Book of Kells every day so that visitors can see different pages of the manuscript whenever they happen to drop by. 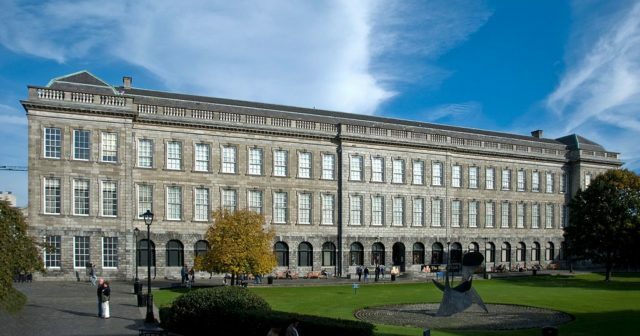 The Library of Trinity College is the custodian of two of the four volumes of the Book of Kells on display for visitors. These were donated to the Library in 1661 by Henry Jones, the Anglican Bishop of Clogher and Bishop of Meath. Glancing at the illuminating pages of the work, one cannot help but wonder at the effort and devotion that went into creating this gem of a manuscript. With limited materials at hand, and living in one of the most remote parts of the world, producing a work of art which is so ornate and delicate is a momentous feat in itself. The history of the Trinity College Library goes as far back as 1592. Another popular attraction for visitors to the library is a room that has a number of marble busts, giving an aesthetically pleasing ambiance to this library’s splendor. Many of these busts are of prominent writers, philosophers, and other renowned figures who supported the college and contributed towards the Library’s cause. 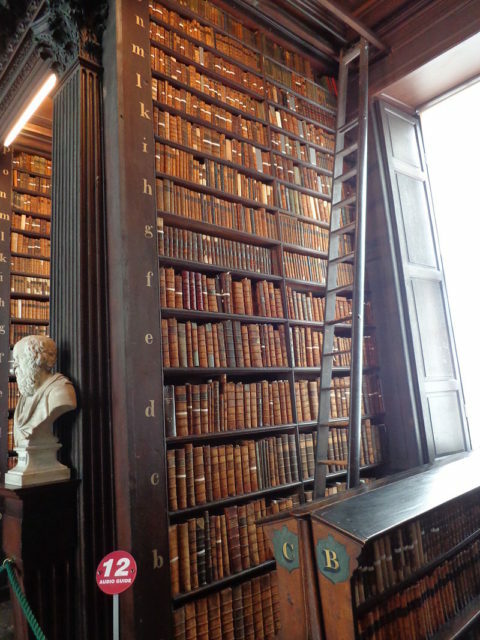 Any book lover who gets an opportunity to visit Dublin, even for a single day, should pay a visit to this spellbinding house of knowledge.